I was going to call this post Wordless Wednesday, when I realised that I’m fooling myself if I think I can post a picture without saying a single word about it. I never manage that, despite my best intentions. But I’m not willing to give up these Wednesday-style posts because they’re some of my favorites to look back on – little snapshots offering a glimpse of something we did or saw or made each week. So from now on I’m going to call these posts Wednesday Window, which is a more accurate reflection on their content I think. This week’s Wednesday Window is showcasing some of our art from earlier in the week. Little Man has been curious about rainbows since he saw one at his grandmother’s last week. So I thought I’d show him how to paint one. He helped of course! But when I suggested he paint his own, he wanted help painting a space rocket instead. Space rocket complete, I suggested rainbows once more but was overruled by a request to paint butterflies instead. 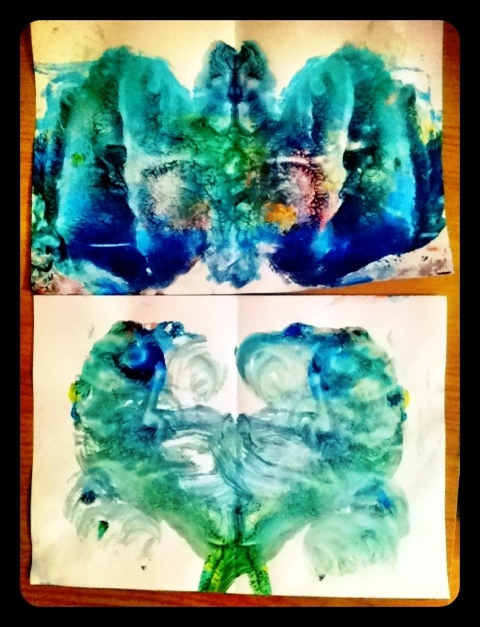 I decided to show Little Man how to create inkblot-style butterflies. Great fun! He loved squishing the paint between the pages and then opening them up to see the results. The finished butterflies went through several metamorphoses with new colors and layers of paint added each time before Little Man declared them “finished”! 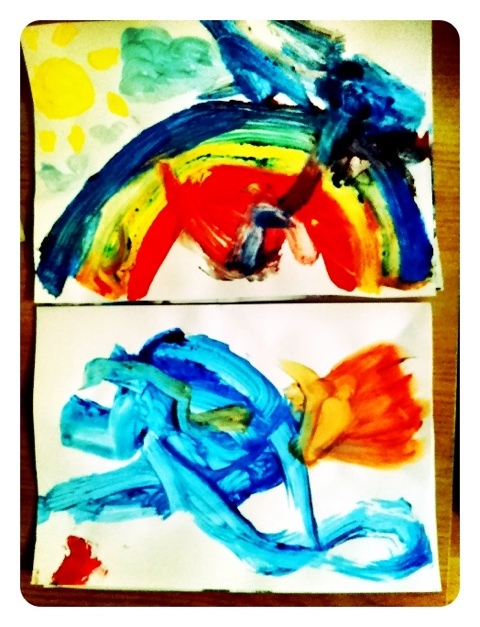 What do you and your kids like to paint together? Got a “Wednesday Window” or a snapshot into your own family life that you’d like to share? Leave a link in the comments below. He told me that last picture is a crab. They are great. Can’t wait till Nathan is at that level. I still haven’t been brave enough to paint with him yet despite having all the supplies. Must do soon. Don’t spend any more time thinking about it Tanya! Just take out the paints and let him off! As long as the paints are washable, it only takes two minutes with a wet cloth to clean up the mess afterwards. And it’s so much fun for them, it’s definitely worth doing. Well I plan to do another one next week. Perhaps I should turn it into a Linky, and you can connect do a Wednesday Window too and connect up? I think there are a few people who have trouble keeping it wordless! Those little minds have a mind of their own 🙂 That last one looks like two fish dancing on their tails! Cute.